Human settlement in the harshest of places. The Avenir: once a generational ship, now a crowded residential station and dominating force over a hard, broken world. Its people have nearly forgotten distant Earth, its wizards ponder the mysteries of the universe, its orphans suffer and beg, while the aristocrats live the high life. 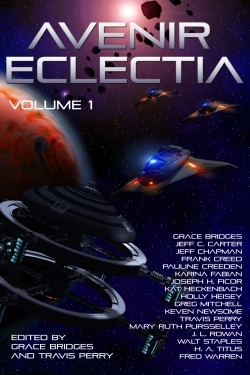 Sheba and Quatermain, the fractured and molten moons of Eclectia, are settled by miners and spacers, while merchants and smugglers ply their trades. For most, survival is an everyday question. Multi-author microfiction gives a many-faceted view of the future. New stories continue to be posted online. Book 1 of the Avenir Eclectia science fiction and fantasy series, short-story compilation for all ages. According to some research, this has yet to actually be published. You can find it at http://www.avenireclectia.com/ as it seems to be online only. I’m assuming as of September 2012 this is an upcoming project? It sounds very interesting. It’s a shared-universe microfiction project, and I hope they bring their anthology to print or ebook form soon. We were fully expecting it to be out now but there have been some delays… it may be a couple more weeks. The Avenir Eclectia website is certainly live, though, with all of the same content. Sorry for any confusion! It won’t be much longer. That’s good to hear. I’d love to get the ebook version, as microfiction is great to read during slow days at work on my cell phone. Best wishes to a good release, and I’ll browse the blog in the meantime.